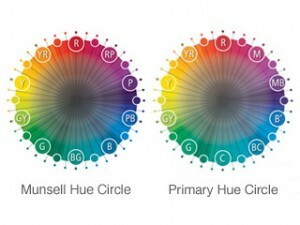 Munsell Color System; Color Matching from Munsell Color Company > color-blog > How is Munsell Hue Circle Relevant to Your Work? How is Munsell Hue Circle Relevant to Your Work? Whether you’re a designer, printer, photographer, or part of the color supply chain, communicating color with clarity and ease is inherent in the Munsell Color Order System. Take the Munsell hue circle, for example. Why did Munsell divide the hue circle into 100 steps of equal visual change in hue? That’s where Munsell built simplicity into the system. He wanted to use a decimal system making each step divisible by 5 or 10—a system which is easy to understand and easy for computer programming and cataloging. That’s why Munsell used 5 principal hues—red, yellow, green, blue and purple—instead of the seven colors in the visible spectrum (ROY G BIV). However, each of the seven colors in the visible spectrum is represented within Munsell’s hue circle. Instead of orange and violet being principal hues, Munsell designated them “intermediate hues” and located them between two principal hues, substituting yellow red instead of orange and red purple instead of violet. So How is This Relevant to Your Work? The Munsell hue circle was slightly adapted in 1993 by Cal McCamy (one of the founding fathers of the popular ColorChecker Chart) to accommodate the science behind several industries including printing, photography, television, color copiers and computer monitors. The revision also applies to today’s electronics devices such as smartphones and tablets. Remember . . . most of these industries didn’t exist back in the late 1800’s when Munsell was conducting research for his color order system. Munsell, being an artist, used paint as a reference point. Therefore the term blue, although appropriate in Munsell’s time, didn’t quite fit its location in Munsell’s Hue Circle relative to the scientific principles behind the newer industries. Here’s why . . .
Color printing applies subtractive color mixing principles comprised of primary colors yellow, magenta and cyan or YMC; and television, computer monitors and devices apply additive color mixing principles comprised of colors red, green and blue or RGB. The location of blue on Munsell’s hue circle wasn’t quite representative of these principles. Blue should be opposite yellow and cyan opposite red and green opposite magenta. If these opposites sound familiar and you’re a designer, then you’re probably thinking of the color wheel, which falls nicely within the Munsell Hue Circle and its revised counterpart, Primary Hue Circle. It’s not that Munsell got it wrong. On the contrary, given the limitations of the technology of the time, Munsell had the visual colors correct, but the nomenclature, given post-Munsell additive and subtractive color principles, needed a slight adjustment.